Recently, pan-Turkist groups have been exaggerating the number of Turkic speakers and giving false statistics to different sites. They claim that in 2008, there are 20,25, 30, 35,40 45 million Turkic speakers in Iran (depending on which pan-Turkist site one looks at)! Note the total population of Iran was 70 million in 2008. This article is not interested in the political nature of these group and why such politically motivated exaggerations are made, rather than that, we provides a scientific response to their false claims. Indeed the inconsistent nature of ethnologue.com can be seen here from their 1996 to 2000 to 2006 editions. Sorry we cannot help you further with this question. This information was posted by a previous editor, and it probably came from his personal communication with someone else, and was therefore not documented. Interestingly enough, Ethnologue which has not done any actual sampling for their 15th edition has also been accused of political meddling and manipulations. We believe the previous editor who had personally communicated must have personally communicated with a pan-Turkist person. SIL has been accused of being involved in moving indigenous populations in South America from their native lands to make way for exploitation schemes of North American and European oil corporations. The most well known example is the case of the Huaorani people in Ecuador, which resulted in many deaths and the moving of the people into reservations controlled by the missionaries. In 1975, thirty anthropologists signed "The Denouncement of Pátzcuaro", alleging that SIL was a "tool of imperialism", linked to the CIA and "divisions within the communities that constitutes a hindrance to their organization and the defence of their communal rights". In 1979, SIL's agreement with the Mexican government was officially terminated, but it continued to be active in that country (Clarke, p. 182). The same happened in 1980 in Ecuador (Yashar 2005, p. 118), although a token presence remained. Remnants of SIL presence were protested in every subsequent Indian uprising. In the early 1990s, the newly-formed organisation of indigenous people of Ecuador CONAIE once more demanded the expulsion of SIL from the country. At a conference of the Inter-American Indian Institute in Merida, Yucatan, in November 1980, delegates denounced the Summer Institute of Linguistics for using a scientific name to conceal its religious agenda and capitalist worldview that was alien to indigenous traditions. I had heard that (Jaime Roldos, President of Ecuador, 1979-81) accused The Summer Institute of Linguistics (SIL), an evangelical missionary group from the United States, of sinister collusion with the oil companies. I was familiar with SIL missionaries from my Peace Corps days. The organization had entered Ecuador, as it had in so many other countries, with the professed goal of studying, recording, and translating indigenous languages. SIL had been working extensively with the Huaorani and Matsés tribes in the Amazon basin area, during the early years of oil exploration, when a disturbing pattern appeared to emerge. While it might have been a coincidence (and no link was ever proved), stories were told in many Amazonian communities that when seismologists reported to corporate headquarters that a certain region had characteristics indicating a high probability of oil beneath the surface, SIL went in and encouraged the indigenous people to move from that land, onto missionary reservations; there they would receive free food, shelter, clothes, medical treatment, and missionary-style education. The condition was that they had to deed their lands to the oil companies. Rumors abounded that SIL missionaries used an assortment of underhanded techniques to persuade the tribes to abandon their homes and move to the missions. A frequently repeated story was that they had donated food heavily laced with laxatives - then offered medicines to cure the diarrhea epidemic. Throughout Huaorani territory, SIL airdropped false-bottomed food baskets containing tiny radio transmitters; The rumor was that receivers at highly sophisticated communications stations, manned by U.S. military personnel at the army base in Shell [a frontier outpost and military base hacked out of Ecuador’s Amazon jungle to service the oil company whose name it bears], tuned into these transmitters. Whenever a member of the tribe was bitten by a poisonous snake or became seriously ill, an SIL representative arrived with antivenom or the proper medicines - often in oil company helicopters." SIL was allegedly financed initially by expatriate coffee processors in Guatemala, and later by the Rockefellers, Standard Oil, the timber company Weyerhauser, and USAID. [...] By the 1980s, SIL was expelled from Brazil, Ecuador, Mexico, and Panama, and restricted in Colombia and Peru. Today, according to SIL's annual report, funds are donations from individuals, churches, and other organizations, channelled to SIL by the Wycliffe Bible Translators. Whether the information above is correct (allegation of SIL’s connection to various government agencies) is not clear or of concern. What I would like to point out here is that Ethnologuedid not have a source for their statistics of the 14th and 15th edition, and they have never been to Iran. And their editors also responded that they do not know their source and their number is incorrect It would not surprise the writer of this article that some pan-Turkists probably provided Ethnologuewith false numbers which they cannot locate and justify. 11,200,000 in Iran (Johnstone and Mandryk 2001), increasing. 290,000 Afshar, 5,000 Aynallu, 7,500 Baharlu, 1,000 Moqaddam, 3,500 Nafar 1,000 Pishagchi, 3,000 Qajar, 2,000 Qaragozlu, 130,000 Shahsavani (1993). Population total all countries: 12,612,660. This 2009 correction is noteworthy considering that several pan-Turkist activists tried to pressure Ethnologue to keep their inflated numbers. In the 2009 edition of Ethnologue however, the information has been corrected. As a group of Iranian and Azerbaijani scholars and human rights activists, we the undersigned would like to express our deepest gratitude to you and all the individuals involved in publishing and maintaining Ethnologue, the most objective and scholarly body of knowledge on world languages. 1) It is a well-known fact that in Iran’s entire history, no kind of census has taken place that would account for the country’s population makeup based on ethnicity, nationality, and more importantly, language. All existing figures and numbers in this area are estimations based on unsubstantiated sources and literature. As such, care must be taken that in estimating the number of each ethnic community, the views of local community leaders, scholars, and human rights activists are taken into full account. In particular, an objective researcher must be cognizant to the fact that, due to lack of respect for human rights and the rights of minorities in Iran, both ruling governments and many scholars of the dominant Farsi-speaking group have always presented a distorted view regarding the size and status of disenfranchised communities in the country. Unfortunately, they still continue to do so. 2) In current Iran, even though the significant portion of the Azeri-Turkic population is living in the provinces of Eastern Azerbaijan, Western Azerbaijan, Ardabil and Zanjan; the entire population is by no means limited to these four provinces. These provinces are recent creations based on dubious government measures and questionable administrative purposes. While constituting the core of Azerbaijan’s geography, they neither correspond to historical Azeri lands nor do they reflect the Azeri inhabited areas in current Iran. In any kind of research on Iran’s Azerbaijani population, it must be borne in mind that the Azeri-Turks reside all over the country, from the current Azerbaijani provinces in the north-west to eastern and central Iran to provinces of Tehran, Khorasan, Markazi, Hamadan, Qazvin, and so forth. Paying due attention to this important issue is not only a matter of objectivity in social research; it is also a matter of consideration for morality and ethics, particularly in dealing with marginalized communities. We are confident that Ethnologue’s competent researchers will pay attention to the above-mentioned factors and, as always, will present a most objective estimation of Iran’s Azerbaijani and Turkic populations in the upcoming edition of Ethnologue. Please do not hesitate to contact us for further information or any kind of assistance. We will be more than happy to provide your researchers with relevant historical and contemporary literature on the subject. Member of Societe Botanique Francais "citologiste"
Professor of Political Sciences at Strayer University, Washington, D.C.
We note that despite this strong pressure from pan-Turk oriented groups who put “Drs and Professors and Human right activities” in front of their title, they were not able to prove their false statistics. Some of these like Asgharzadeh, Beraheni and Sadr al-Ashrafi have ignored all statistics and only concentrated on the flawed 15th edition of ethnologue in order to pursue their ethno-nationalistic political interests. We will show that the Ethnologue 2009 version is fairly accurate(11-12 million Azeri-Turkic speakers) based on provincial statistics in Iran. 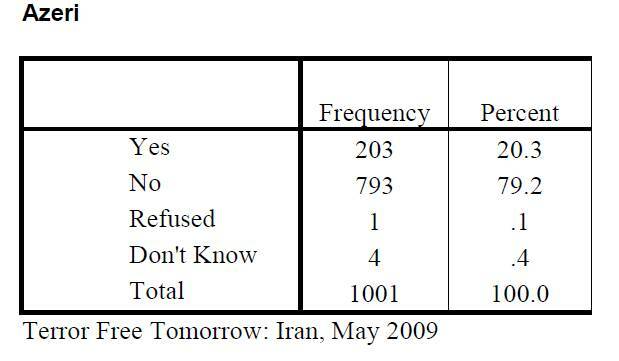 L et us now look at some actual statistics done in Iran. 1) The first statistics is provincial statistics from Iran. This is the most accurate and up to date census available. If we take the areas of predominantly Azerbaijani speaking population, that is East Azerbaijan, Zanjan, Ardabil and half of West Azerbaijan (although there are sources that mention majority Kurdish speakers as much as 70% and the Kurdish birthrate is actually higher than the national average), we obtain: 6.96 million. So this is rounded up to 7 million. If we assume 1.5 million in Qazvin, Hamadan (actual statistics done put Turcophone population at 28% mainly in the low populated areas of Bahar, Razan and Kabudar Ahang), Gilan (at most 10%), Arak and everywhere else in Iran except Tehran, we can safely say it is 1.5 million. This is now 8.5 million. Now in Tehran, about 95% of people speak Persian as their first language according to Hamshahri and many Azerbaijanis there have adopted Persian, have mixed with other Iranians and have become “Tehranis”. Despite this, if we assume 4 million Azerbaijani Turcophones in Tehran (which is an upperboud), we obtain 12.5 million. Thus this is also close to the ethnologue 2009 edition and this was an upperbound. In reality there are Tats, Talysh, Kurds, Armenians, Assyrians and standard Parsi-Dari speakers in East Azerbaijan, Ardabil and Zanjan as well and many Azerbaijanis in Tehran have become Tehranis. The next statistics is a recently done weighted survey by a US based organization. Although the organization’s name is political (Terror free Tommorow), however the statistics were done in an independent fashion. covering all 30 provinces of Iran, with a margin of error of +/- 3.1 percent"
Is no where that claimed by pan-Turkists. Indeed our estimate of 12.5 million (2009) is within the margin of error. In contrast the number of people that understand Persian according to the same census is 100% (1001 out of 1001). The next statistics is about languages rather than ethnicity. In Iran, Persian is the official language and according to the CIA factbook literacy (which means knowledge of Persian) stands at 77%. Although it is not clear how many percent of those literate in Persian are literate also in other languages and how many percent of the native Persian speakers are literate. 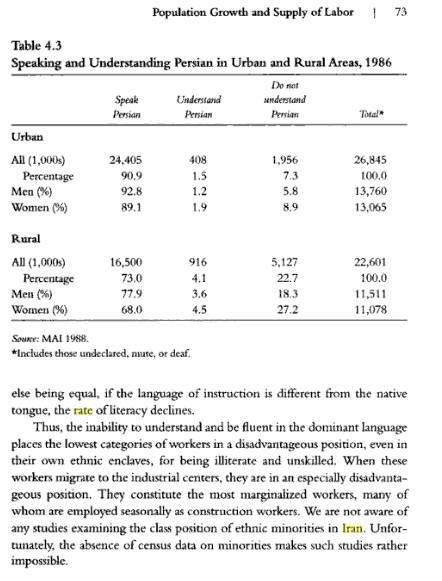 The enclosed statistics is important because it was an actual census and shows how many people speak Persian as a first language. Which can be found in Amazon as well as Syracuse university peress. Relavent pages with regards to percentage of population that speaks Persian. We note that (by the year 2008) Zanjan and Qazvin where one province, but later separated to two. Qazvin is predominantly Persian speaking but Zanjan is predominantly Azeri speaking. Khorasan is also now three provinces (Razavi, Shomali, Jonubi). Golestan (with a large Turkmen population) was also separated from Mazandaran. The third source I would like to introduce from 1949-1954 and called the Manual on Iranian Geography, published by the Iranian army of the late Shah’s government . Iran. Artish. Sitād-i Artish. Dāyirah-i Jughrāfiyāʾī. Farhang-i jughrāfiyāʾī-i Irān : ābādīhā. Vols. 1-9 compiled under the general editorship of Hossein ʻAlī Razmārā. (Shahrzad Mojab and Amir Hassanpour, “The politics of Nationality and Ethnic Diversity”, Saeed Rahnama and Sohrab Behdad, eds., Iran after the Revolution: Crises of an Islamic State (London: I.B. Tauris, 1995), pp. 229-230. According to this book the population of Iran in 1335 was 14 million. From this 14 million, 2451061 people lived in a mono-lingual Turkish(Azeri) setting, 877627 lived in a bilingual Persian-Azeri setting and 187464 lived in a place where Persian/Turkish/Kurdish was spoken. 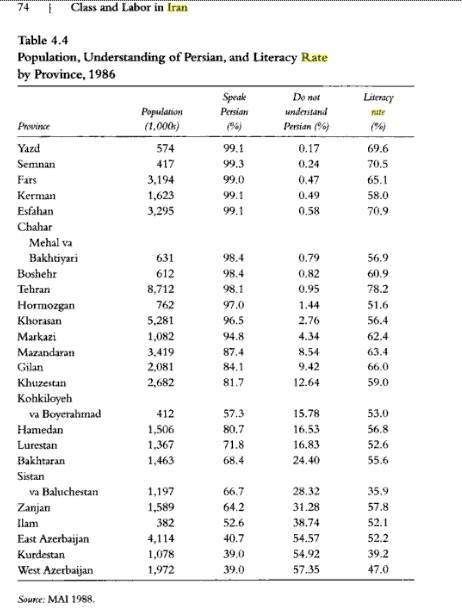 Thus the range of Azeri speakers is from 17.5% to 25.1% according to this actual statistics that was done. This is agreed with statistics with part 3 where we quote some expert references. Note the importance of this census is that it was actually done and it is not based on guest work. Another source I would like to discuss and which also provides a sample is based on census taken in the Iranian month of Mordad (July 21 – August 21) in 1991. In this census, all 49,588 mothers who gave birth in the country, were issued birth certificates. They were asked about their mother-tongue. The break down: 46.2% (Persian/Farsi), 20.6% (Azeri-Turkish), 10% Kurdish, 8.9% Luri, 7.2% Gilaki and Mazandarani, 3.5% Arabic, 2.7% Baluchi, 0.6% Turkmen, 0.1% Armenian, and 0.2% Others. زنجاني‌، حبيب‌ الله‌، محمد ميرزايي‌، كامل‌ شاپور و امير هوشنگ‌ مهريار، جمعيت‌،توسعه‌، بهداشت‌ باروري‌، چاپ‌ دوم‌، تهران‌، نشر و تبليغ‌ بشري‌، 1379. Zanjani, H.,Mirzai,M.,Shapur, K., Mehriyar, A.H., “Population, Growth, Mortality Rate”, Second Edition, Tehran, Tabligh-e-Bashari Publishers, 2000. Note the sample size is very large. Curzon of Kedleston, George Nathaniel Curzon, Marquess, 1859-1925. (Persia and the Persian question, by the Hon. George N. Curzon, 2 v. illus., plates, ports., maps (1 fold.) 23 cm., London, New York, Longmans, Green & co., 1892.). Based on the Russian scholar Zolatoraf who used official Iranian documents in 1888, the population of Iran was recorded as six million people, half of these were Persian, 1 million Turk/Tatar (the name Azeri was a recent designation and in the 19th century, the term Turk/Tatar was used for the speakers of this language), Lurs 780,000, Kurds 600,000, Arabs, 300,000, Turkmans 320,000. And the rest were Armenians, Assyrians and other groups. Large number of Assyrian Christians actually existed in Iran before they were massacred by the pan-Turkist young Turk government invasion of Western Iran during WWI. About several statistics that were actually taken in Iran. 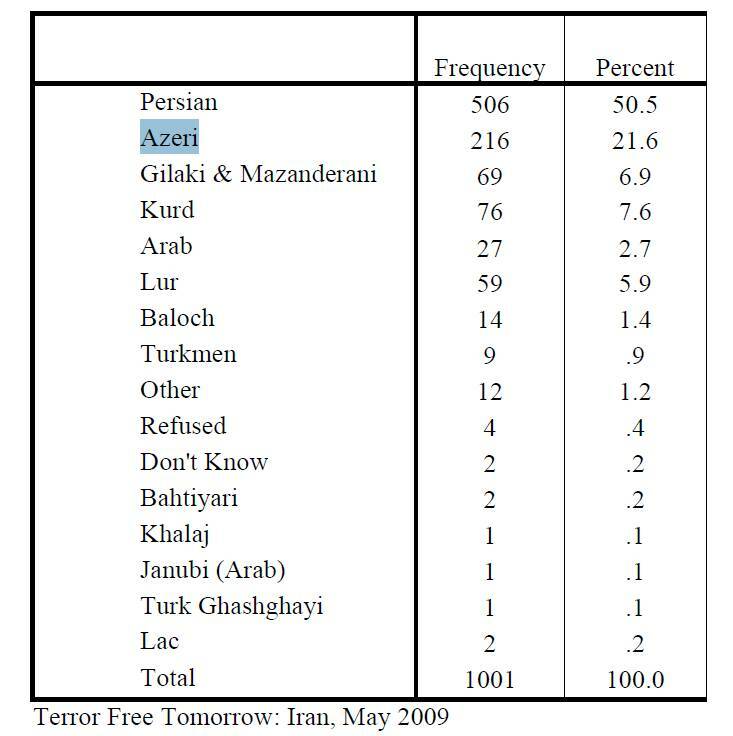 The most recent statistic (2006) gives provincial statistics of Iran and the number of Azeri-Turkic in Iran can be upperbounded by 12 million in these statistics. So one wonders where do the pan-Turkists get (in 2008) their 45 million? Or 30 million? Or even 20 million? Iran is a multilingual and diverse cultural society, and the majority of the population is extremely young. Nearly one-half of the people speak Farsi, and another one-fourth speak some other Indo-European language or dialect. These are descendants of the Aryan tribes, whose origins are lost in antiquity. The Kurds, whose language has seen scant modification over the centuries, are a fierce nomadic people dwelling in the western mountains of Iran and in Iraq and Turkey. They constitute a small percentage of Iran's population. They have resisted the Iranian government's efforts, both before and after the revolution of 1979, to assimilate them into the mainstream of national life. Also inhabiting the western mountains are seminomadic Lurs, thought to be the descendants of the aboriginal inhabitants of the country. Closely related are the Bakhtyari tribes, who live in the Zagros Mountains west of Esfahan. Both speak Luri, a language distinct from, but related to, Farsi. The Baluchi are a smaller minority who inhabit Iranian Baluchistan, which borders on Pakistan. About one-fifth of Iranians speak a variety of Turkic languages. The largest Turkic-speaking group is the Azerbaijani, a farming and herding people who inhabit two border provinces in the northwestern corner of Iran. Two other Turkic ethnic groups are the Qashqa'is in the Shiraz area to the north of the Persian Gulf and the Turkmen of Khorasan in the northeast. The Armenians, with a different ethnic heritage, have maintained their Indo-European linguistic identity. They are concentrated in Tehran, Esfahan, and Azerbaijan and are engaged primarily in commercial pursuits. A few isolated remnants of Dravidians are found in the Sistan region to the southeast. “The second largest group, Turkic, constitute another 26% and are subdivided into the sedentary Azaris, the vast majority of Azarbayjan and a significant minority in the northern towns and tribal Turkmens, Qashqayis, Shahsavans, and Afshars, who form distinct entities in the north and southern province of Fars”. The following formerly posted on a Christian website is one of the most accurate in terms of distinguishing different Iranian dialects. Peoples: Over 65 ethnic groups, many of which are small nomadic groups. Indo-Iranian 75.6%. Persian 25,300,000; Kurds 4,670,000; Luri-Bakhtiari 4,280,000; Mazanderani 3,265,000; Gilaki 3,265,000; Dari Persian 1,600,000; Balochi 1,240,000; Tat 620,000; Pathan 113,000; Talysh 112,000. Turkic 18.8%. Azerbaijani 8,130,000; Turkoman 905,000; Qashqai 860,000; Hazara 283,000; Teymur 170,000; Shahseven 130,000. Arab 2.2%. Mainly in southwest. Christian minorities 0.4%. Reduced from 1.5% in 1975 due to emigration. Armenian 170,000; Assyrian 40,000; Georgian 10,000. Other 3%. Gypsy (Nawar and Ghorbati) 1,188,000; Brahui 149,000; Jews 68,000. Refugees: Afghans 1.5 million, but decreasing; Iraqi Kurds 120,000 (at one stage in 1991 there were 1.2 million); Shi'a Arabs from Iraq. Colbert C. Held, John Cummings, Mildred McDonald Held, “Middle East Patterns: Places, Peoples, and Politics”, Westview Press, 2005. 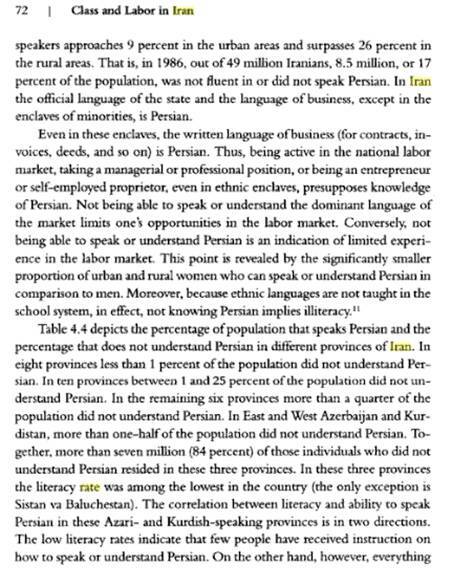 Pg 97: “Farsi is the language of Iran, although nearly half of the Iranians speak a mother tongue other than than Persian( Azeri, Kurdish, Gilaki, Luri, Baluchi, Arabic, and others)”. and a majority of West Azarbaijan. account for over 85 percent of all Turkic speakers in Iran. Iran’s population is made up of numerous ethnic groups. Persians migrated to the region from Central Asia beginning in the 7th century bc and established the first Persian empire in 550 bc. They are the largest ethnic group, and include such groups as the Gilaki, who live in Gilān Province, and the Mazandarani, who live in Māzandarān Province. Accounting for about 60 percent of the total population, Persians live in cities throughout the country, as well as in the villages of central and eastern Iran. Two groups closely related to the Persians both ethnically and linguistically are the Kurds and the Lurs. The Kurds, who make up about 7 percent of the population, reside primarily in the Zagros Mountains near the borders with Iraq and Turkey. The Lurs account for 2 percent of the population; they inhabit the central Zagros region. Turkic tribes began migrating into northwestern Iran in the 11th century, gradually changing the ethnic composition of the region so that by the late 20th century East Azerbaijan Province was more than 90 percent Turkish. Since the early 1900s, Azeris (a Turkic group) have been migrating to most large cities in Iran, especially Tehrān. Azeris and other Turkic peoples together account for about 25 percent of Iran’s inhabitants. The remainder of the population comprises small communities of Arabs, Armenians, Assyrians, Baluchis, Georgians, Pashtuns, and others. The World Almanac and Book of Facts, Contributor Zoë Kashner, 2007. Robin Morgan, “Sisterhood is Global: The International Women's Movement Anthology”, Published 1996. 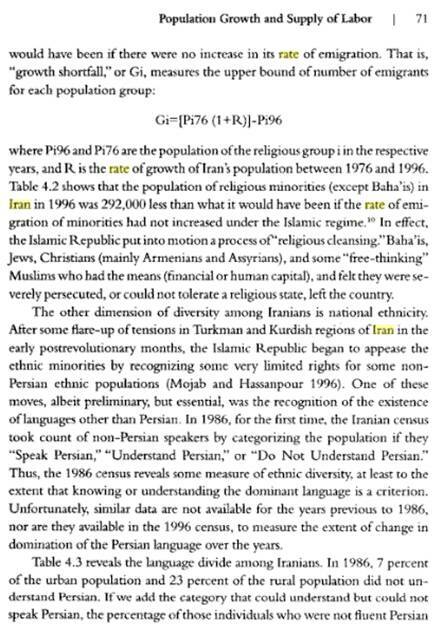 Pg 324: Ethnic groups: Persian 66%, Azeri 25%. LANGUAGES: The official language is Persian or Farsi which is spoken by 54% of the population. Other minority languages include Kurdish, Luri, Baluchi, Turkmen, Azerbaijani, Armenian, Assyrian and Arabic. The current Ethnologue figure of 2009 (unlike that of the 2005), despite pressures from pan-Turkist and politically oriented groups is correct. Also I have shown that the Azerbaijani population in Iran based on provincial statistics can be upperbounded by 12 million. I would like to add that Azeris are prominent members of Iran’s society (the supreme leader of Iran is an Azeri) and thus due to their presence in the government, economy and armed forces, some sources might have over-estimated their number. In 1890, the total Tatar (what Azeri’s were called then) was 1 million out of 6 million or approximately 16-17%. In the 1906 constitutional revolution, Persian was declared as the official language and schooling was done in this language. Before that, Persian was the main composition language of all of Iran and was the only language that was systematically thought alongside Arabic in the traditional schooling (Maktab) system. 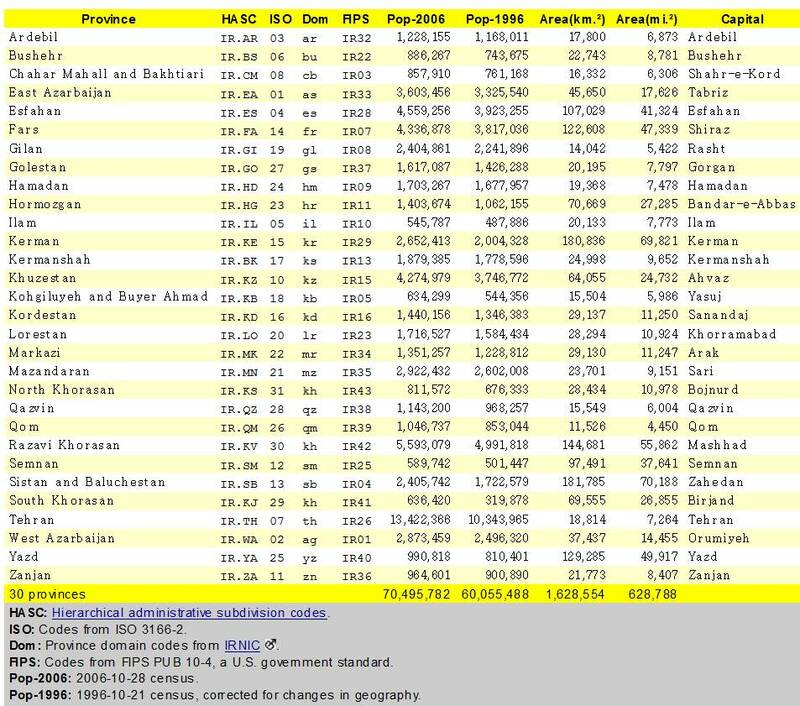 The current population of Iran according to the official census of 2006 is 70 million and assuming steady growth for all groups (actually large number of Azeris specially in Tehran have adopted Persian), the population of Azeris would be between 11-12 million. This agrees with the provincial statistics and some of the expert sources brought. It agreed with basically all actual census that was carried out in Iran even in the year 2009. Of course the pan-Turkist groups will claim 20, 25, 30,35,40,45 million (in 2009), but these claims are of political and not scientific nature. So why are these political claims made? I believe they are psychological, that is the pan-Turkists want to feel bigger than they are and want to influence foreign governments that they are a huge force. They should note that out of the 12 million or so Azeris, the overwhelming majority of Iranian Azeris are not with them and they should also note that situation of Iran might change one day, and it is not prudent to antagonize the Iranian population (not only patriotic Azeris but the majority Iranic speakers of the country who are indeed no friends of pan-Turkist concepts).